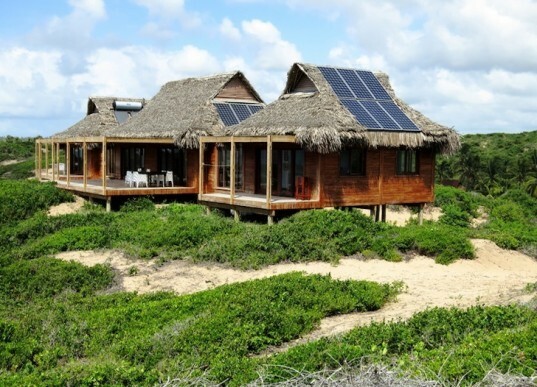 We've seen a lot of rooftop solar panels and quite a few thatched projects, but the combination of both on this home in Mozambique may well be a first. This striking home by Timber Design consists of three separate units topped with Makuti thatch typical of vernacular architecture in Tofo - and it operates entirely off-the-grid. The solar panels provide sufficient energy to electrify and illuminate the home and are partially used to heat water. Gas is added to the mix as well, but other than that, this Indian ocean home is completely off-grid. Black and gray water are separated and eventually the designer hopes to use methane harvested from the blackwater effluent to generate additional energy. Locally-sourced Zimbiri timber was used for the external cladding and decking, and the home is incredibly well-insulated – so much so that the client claims that it feels air-conditioned even when it is 30 degrees Celsius outside. 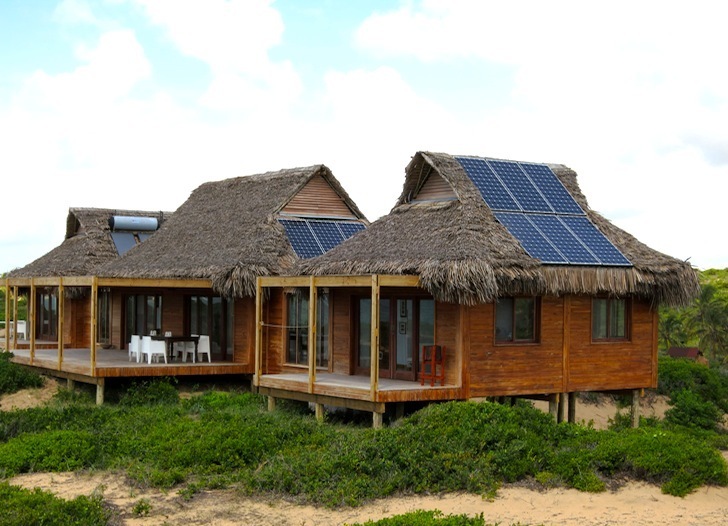 Integrating the PV panels with the thatched roof (made of coco palm leaves) was perhaps the greatest design challenge, but they pulled it off without a hitch and we absolutely love the fusion of beach architecture with modern technology.